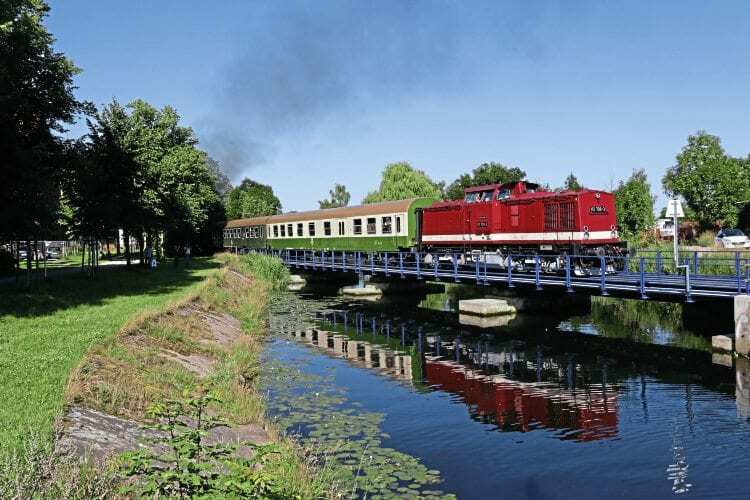 GERMAN operator PRESS has operated a series of weekend steam services on branch lines on Germany’s Baltic Coast this summer, many in conjunction with local festivals or special events. Two locos, both formerly used by East German operator DR, have been used – 2-8-2T 86 1333 and ex-DR V100 diesel hydraulic 112 708 (DB 202 708), normally operating as top-and-tail. Between July 14 and16 services were operated by both locos in top-and-tail mode in conjunction with the annual Greifswalder Fischerfest. They operated from Greifswald Hbf (on the Stralsund to Berlin main line) to Ladebow using the 5.5km-long freight-only branch. Later in July, services operated on the Velgast to Barth branch, which currently has a passenger service, although this is due to be removed from December 9 because of cost cutting by the regional government.